EKU sold $21 million in bonds to fund the first residence hall built on campus in 40 years. "We were looking for a signature building," said James Street, vice president of capital planning and facilities management. 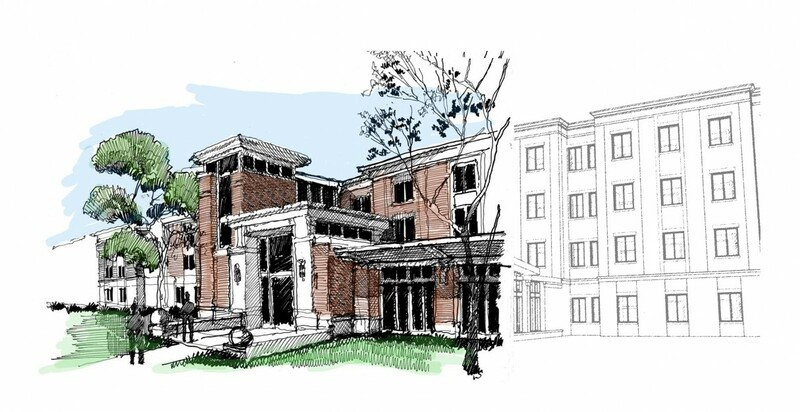 Mackey Mitchell, with local Architect-of-Record Ross Tarrant, was selected to design a 259 bed, 86,400SF residence hall for upperclassmen. The $17.9 million, LEED Gold project is in keeping with the university's direction in environmental stewardship and economic efficiency. With over 20 sustainable and innovative design features, the residence hall met stringent standards related to sustainability, energy and water efficiency, indoor environmental quality, and materials and resources used in construction. A brick and stone exterior conveys a traditional, inviting residential feel with a welcoming front desk strategically placed for secure views of all first floor elevators and residential area entrances. The main entry leads to a multi-purpose room/student lounge with a movable partition to provide flexible use of space. A central pavilion provides a warm, inviting place for students to socialize and interact in their showcase community kitchen. With its cost-saving energy efficiency features, the res hall reflects "great value for the dollar," said Carroll McGill, project manager with the Kentucky Finance and Administration Cabinet. "And it was completed within budget." Sophisticated mechanical systems, high recycled content materials, and preservation of healthy mature trees are just a few of examples of how EKU is approaching the way buildings are designed and constructed on campus. 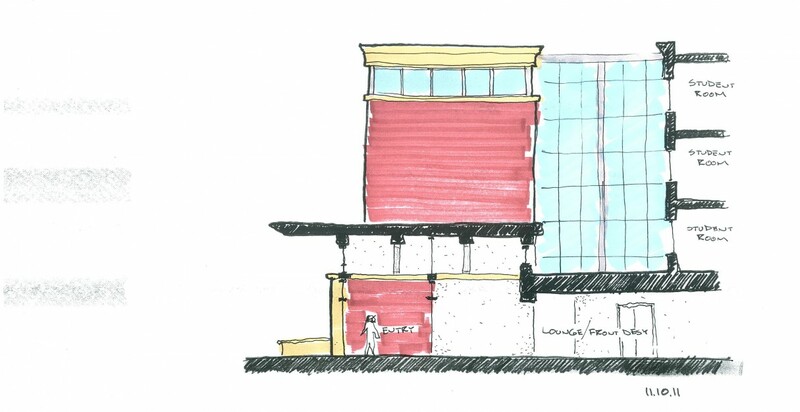 Here is a conceptual sketch of the entry and common spaces on the first floor. 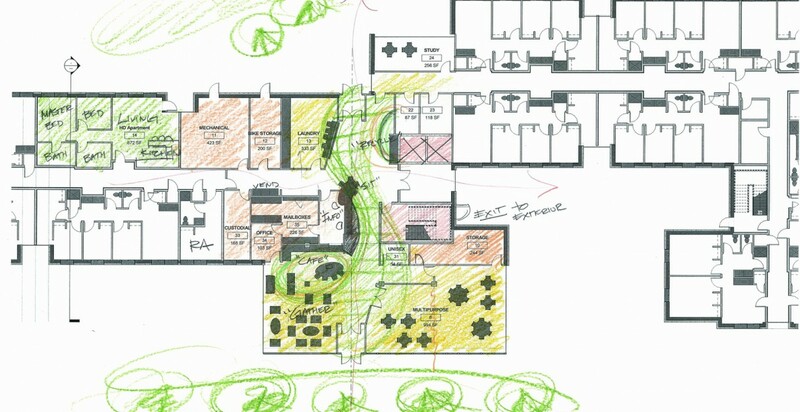 During the early phases of design, it is helpful to sketch both the elevation and that plan together to coordinate ideas. Sections are helpful during all phases of design. Here is a section through the main entry in order to understand scale. 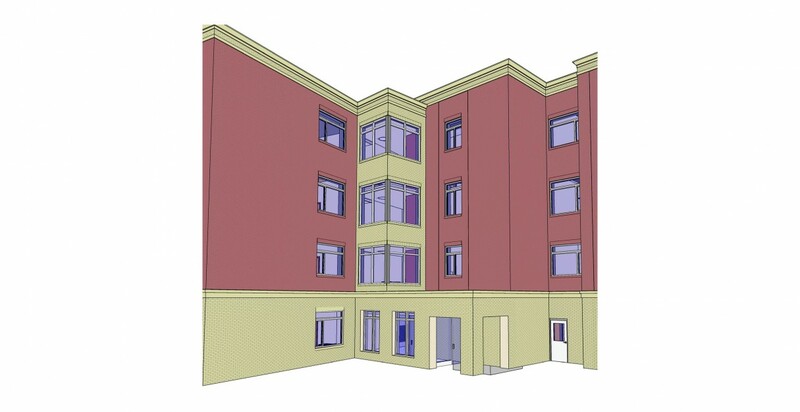 This color image shows the development of the entry design. 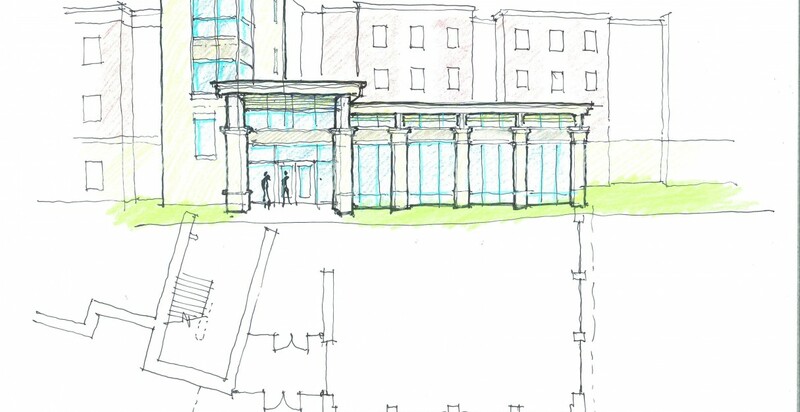 In a residence hall project, all entries into the building are important and require study. Here is a secondary entrance into the building for review. Most of our students are environmentally savvy, so they want to feel like they are a part of it. It’s all a part of … responsible citizenship and building tomorrow’s leaders.